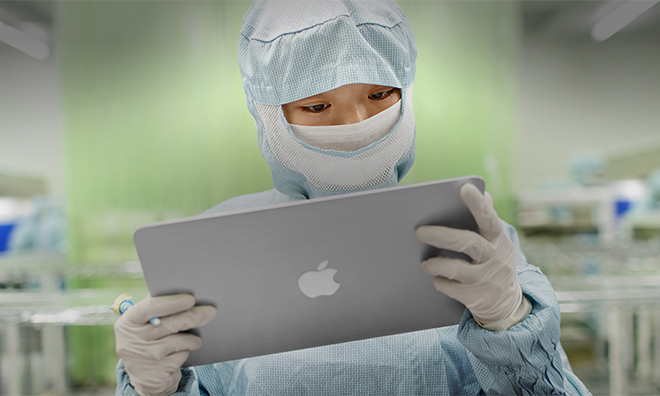 Following up on news that Foxconn would soon deploy robots on assembly lines dedicated to Apple products, a report out of Asia claims the so-called "Foxbots" will have a limited role in device assembly as humans are still needed for most operations. According to industry insiders, Foxconn's Foxbots will only assist human workers by locking down screws, polishing parts and performing other menial duties when they are finally installed on the production line, reports Taiwan's United Daily News. The publication's sources said workers are still required for final assembly and quality control of various procedures, though the final robot-to-human ratio is unclear. These people also expect the Foxbots to roll out at Foxconn's factory in Zhengzhou, which is responsible for manufacturing Apple's top-tier iPhone products. Foxconn CEO Terry Gou on Sunday said his company's Foxbots have reached the final stage of testing and would see deployment in at least one major factory. For its first rollout, the firm is reportedly planning to field as many as 10,000 robots at a cost of $20,000 to $25,000 each. Following the initial 10,000-unit batch, Gou said he expects Foxconn's factories to get Foxbots at a rate of 30,000 per year. In November of last year, the Zhengzhou plant supposedly hit capacity in making up for low iPhone 5s supplies, churning out some 500,000 units per day on a 24-hour operating schedule. At the time, production of the iPhone 5s was said to require 600 workers per assembly line, compared to 500 people for the previous generation iPhone 5. If Tuesday's report is accurate, Foxconn's robot initiative may be a move to accelerate iPhone build times, not replace existing employees as previously thought. The theory jibes with rumors from June that claimed the firm will hire some 100,000 new workers in a ramp up to iPhone 6 production this month. Apple is expected to release two new iPhone models with 4.7-inch and 5.5.-inch screen sizes when the usual refresh cycle comes around in September. Bearing the same overall aesthetic, both versions are expected to be completely redesigned with a thinner chassis more akin to the current iPad Air and iPad mini with Retina display. Some analysts believe Apple will attempt to differentiate the larger "phablet" variant from its smaller siblings by adding high-end features like optical image stabilization and more onboard storage. Although Apple has yet to announce the next-gen iPhone, recent rumors have already guessed at a launch date on either Sept. 25 or on Sept. 19.